This is a great product to put in lunch boxes, back packs, purses, etc. Gently cleans hands when water is not available. In glass measuring cup, measure out the aloe vera gel. Using a plastic dropper, add correct amounts of tea tree, lemon and lavender essential oils. Add color of choice. The batch can be split in half and a few drops of each color can be added. Fill malibu bottles with product using a piping or zip close back with tip cut off. TO USE: Place small amount of product in hands and rub together. Essential oils naturally cleanse the hands when water is not available. Note: Other essential oils to use: lemongrass, myrrh, neroli, patchouli, peppermint, rose, sandalwood, thyme, ylang-ylang. Maximum total usage - 4.8 ml. 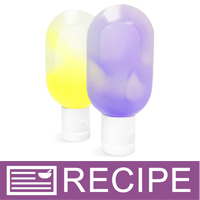 "Can the Vita Burst Beads be added to this recipe in lieu of liquid color? if so, what percentage? Can a combination of the beads be used or only single application? Thanks!" Staff Answer Use can use Vita Burst beads in this hand cleaner. There is no specific amount. Just add until you reach the look you want. You can use multiple colors, if you wish. If using in a pump bottle, too many beads can clog the dip tube. "I was able to easily fill these little bottles by first filling an 8 oz Malibu Bottle with the finished product and then pressing the into the smaller 15 ml bottle. It made fast work. " Staff Answer Thank you, Nancy, for this helpful hint to fill these tiny bottles! "This recipe does not contain a preservative. If it is not going to be used immediately, should a preservative be added? Thank you." Staff Answer No, the aloe vera gel and essential oils used to make this product do not need a preservative. "Is it necessary to use the tea tree EO? It smells absolutely horrible and takes a lot of the other fragrances to drown it out. Thank you, Lynda"
Staff Answer You can substitute the Essential Oil for another that you prefer. We chose Tea Tree EO for its believed antimicrobial properties. If making a substitution, we recommend researching EOs for another that has similar properties. Be aware that some oils are naturally darker and may change the color of your final product and be conscious of the IFRA safe usage rates of the new essential oil you choose. 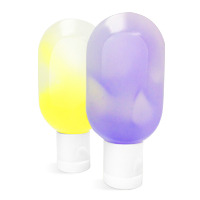 "These bottles are the perfect size to slip in your purse or take to the beach. But, they are time consuming and difficult to fill. Partly because the Aloe Vera Gel is thick and the neck of the bottle is so small. I tried a piping bag but the Gel still clogged at the neck of the bottle. Can I heat the Aloe Vera Gel so it's not so thick or will it ruin the Gel? Is there a better way to fill these bottles? Thanks for the help! Michelle "
Staff Answer Aloe Vera Gel really does not thin out when heated, rather it holds its texture and consistency. We found that the best way to fill these bottles was with a piping bag or Zip lock bag. I found the easiest way to fill the bottle was to cut off the tip on the fat end of a pipette. Then put the small end into a heavy duty ziplock bag which has a tiny hole in the corner. Sorta force it tho go through the hole so you have a really tight fit. Put the gel in the bag and sqeeze out the air. Put the tip of the pipette completely into the bottle and start filling. Bring the tip up slowly as the bottle fills. A bit time consuming but well worth it!